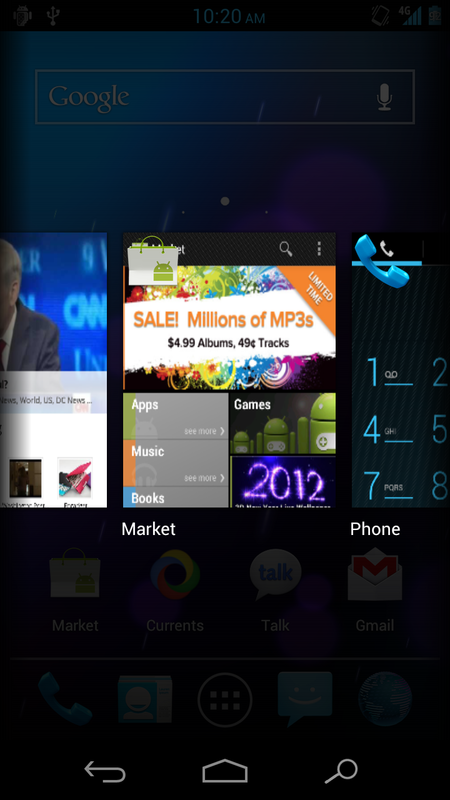 The built-in app switcher for Ice Cream Sandwich makes jumping between your most recently used apps a breeze and is easily one of our favorite features. In previous versions of Android, you were stuck with 6-10 of your previous apps in a not-so-fashionable box without much control over them other than the ability to tap to initiate. In Android 4.0, not only can you scroll through a list, but you can swipe them away if you no longer want them appearing or to help tidy up your list. It’s a massive change, but again, almost everything is in ICS. Well, what if not everyone was as satisfied as we were and actually wanted their app switcher to function horizontally rather than vertically? The developer community for this phone has you covered with this new “webOS” styled switcher that flips your most recently used apps list on its side. You should still be able to swipe them away, only this time it’s up or down rather than left or right. *So far, this mod only works with the Android Open Kang Project ROM, but brucekey has released the code to it so that others can port it to a variety of ROMs. 1. Download the file above to your phone. 3. Make a quick backup, just in case something goes wrong. 4. Then “install zip from sd card” and “choose zip from sd card” to select the file. 5. Flash it, reboot and enjoy. To keep up with this mod, head over to RootzWiki.